Most businesses today have eradicated their paper trail as much as possible. Gone are large filing cabinets, office space devoted solely to storing boxes of invoices, remittance advices, purchase orders and HR information. The world has gone digital. However, paper receipts have stubbornly persevered. Let’s face it, little bits of paper to demonstrate proof-of-purchase can be a nuisance. They crowd your wallet, fade in the sunlight and can be lost in the blink of an eye. Thankfully, receipt scanning technology is here to remedy the problem. Receipt scanning is an emerging technology that allows businesses to record a digital copy of their expenditure. Using a smartphone and the wave of your finger, anyone can digitally record and store every transaction made. However, as with all innovation, the technology isn’t without a few niggling issues. Here’s a brief explanation of the technology, its capabilities and the limitations that will be overcome in the future. What is OCR Receipt Scanner Software? Optical Character Recognition or Optical Character Reader is the name ascribed to the electronic conversion of paper to digital text. OCR is widely-used on as a form of data entry when transferring official paper documents to a digital display. This can include passport scanning, invoice or bank statements, and of course, digital receipts. Although it may sound technical, the process of scanning real-time optical character recognition is quite simple. Using a smartphone application and camera equipped with character recognition software, text is scanned into a device and then recreated on a digital display. Expensify is one of the leading OCR receipt apps in the market today. Available free from the App Store, Expensify takes makes expense report recording and calculation a breeze. Using your smartphone camera, you take a picture of your receipt and Expensify identifies and highlights the relevant charges. Users can even track their mileage and travelling time and fill out a self-assessment expenses. But, the best part is that Expensify can scan and record direct credit card charges – saving you the time of finding every receipt and manually entering each amount. Taking receipt scanning to a whole new level, Receiptmate is another must-try app. With a quick swipe of your finger, Receiptmate scans and saves all the data to Evernote. This can then be stored and accessed in multiple file formats from an Evernote account. You can view all your transaction data as a PDF or in an Excel spreadsheet and can even customise and highlight data elements transferred from the receipt. How Accurate is the Receipt Scanning Technology? Today, advanced recognition systems, capable of recreating text on a screen are commonplace. OCR scanners have the capability to recognise most fonts, and they support a wealth of digital file formats. However, as the technology is evolving from its embryonic stage, it should be noted that scanners do not yet support the approximate 30,000 digital display font families. What Are the Other Issues Yet to Be Overcome? 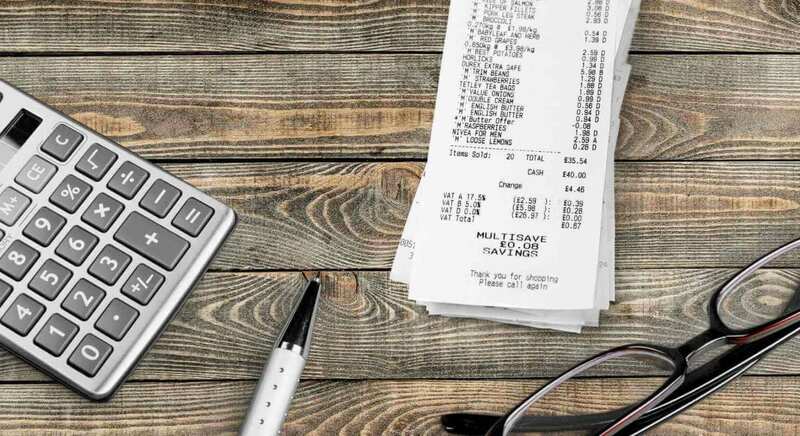 There’s no doubt that the ability to digitally scan and record bills, receipts and a plethora of personal, commercial and financial data will eventually revolutionise how we manage our expenditure, but until the technology is perfected there are some issues to be acknowledged. OCR scanning technology can fail to record data elements. This can include text characters, individual lines or, in rare cases whole descriptions. This can compromise auditing and pose an issue when compiling budgeting plans or detailed reports. The technology also does not have the capabilities to scan and transfer large images to a pixelated format quickly. OCR technology recognises each character individually and this delays the processing time. As the technology evolves, it’s anticipated that facilitating the transfer complex imagery will become commonplace. The other primary limitation is that there is no auto-correct function. Incorrect information must be manually corrected on the digital display. Despite the percentage of mistakes being relatively low, time is still required to review the digital display information to ensure it corresponds with that the paper. There is no denying that the benefits of OCR scanning technology will revolutionise that way that we record and store data of all descriptions. With advancements made every day and a wealth of available smartphone applications, before we know it, the technology will become an integral part of our lives. To discover more about optical character recognition software and how it can simplify your businesses’ receipt recording, contact Tab Scanner, the world’s most advanced receipt scanning technology provider. Or click on the button below to get started with the API.